Provides the insights and tools medical practices need to understand the RBRVS system and calculate payment schedules accurately. Includes improvements to E/M payment, and helps calculate the Medicare Payment Schedule, including the 2019 Relative Value Units (RVUs) and Payment Policy Indicators for each Physician's Service and Geographic Practice Cost Index. Understand the RBRVS system and calculate payment schedules. 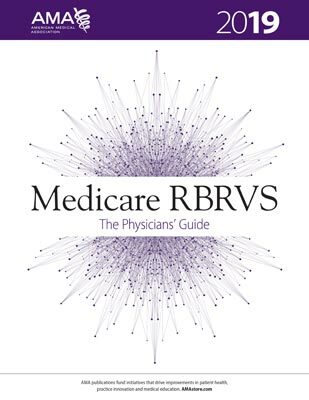 AMA's Medicare RBRVS: The Physicians' Guide 2019is a concise, trusted resource on Medicare's RBRVS system. It provides the insights, tools and tables needed to understand the RBRVS system and to easily and accurately calculate payment schedules. Also includes an Excel file of the complete RVU table. The 28th edition of Medicare RBRVS: The Physicians' Guide 2019 provides the much-needed updated information on the new 2019 Medicare Physician Payment Schedule, payment rules, conversion factor, CPT® and HCPCS RVUs, and GPCIs that affect the physician practice. This book is a must-have tool for physician practices because it offers invaluable insight and information needed to understand Medicare's resource-based relative value scale (RBRVS) payment system, and to help physician practices establish physician charges and to calculate Medicare payments.